A video titled "Busina" showing TV personalities RR Enriquez and Jeck Maierhofer bullying a sleeping FX taxi passenger has gone viral online. 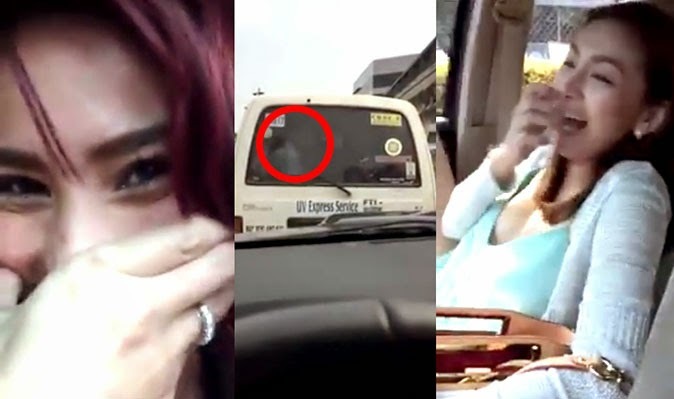 In the 1-minute video, RR and Jeck, hosts of TV5 show Happy Wife Happy Life, are seen laughing inside a car as they try to awaken a tired man in another vehicle stuck in traffic. "Okay ladies and gentlemen, ang gagawin po namin is bubusina po kami para magising si kuya (what we will do is honk to wake kuya up)," said RR, model and former Wowowee dancer and co-host. The video, posted on the Facebook page of motoring magazine TopGear Philippines, got 11,823 likes, 5,711 shares and 790,681 views as of 3:20 p.m. on Sunday, February 8. Netizens on social media called the two rude and ill-mannered. Using their Instagram accounts, RR and Jeck apologized Sunday afternoon after their video went viral on FB and YouTube and became a trending topic on Twitter. RR has made her IG account private since.